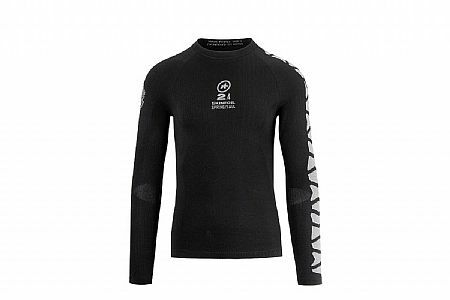 Once you ride Assos, you can't go back..
Great base layer in every respect. I've been using Assos gear for about 15 years and every piece they make is exceptional in its own right. The base layers are perhaps their most effective asset! This Fall-long sleeve item works perfectly as described. I see that they have replaced the previous 6 or 7-piece range of base layer (ALS system) with just 4 or 5 items, ranging from winter through hot summer, and they all do what they are supposed to. The hardest thing is getting winter clothing to wick and yet ventilate, and Assos seems to be magical in this function. Whether it be outer wear, jackets or tights, they have it nailed with proprietary fabrics and sewing methods that simply make the garments work perfectly for their intended temperature range. The one little peculiarity about this particular item (which was not in the previous version of the fall base layer) is the stitching down the inside of the left arm has a lot of loose threads which get caught in the thumb or fingers while getting dressed. As far as I can see, this pattern is merely for style or design, and is only annoying while getting dressed - does anyone else have this same problem?? Otherwise, I'm in heaven . !